Carlos Tevez walked slowly, defiantly from the City of Manchester Stadium to a standing ovation yesterday afternoon. Three minutes remained on the clock, but Manchester City manager Roberto Mancini correctly calculated Chelsea had run out of time to avoid their first defeat of the season, a 1-0 loss inflicted by the little Argentine’s 59th-minute strike. As City’s supporters celebrated, there was no sign of the man who had largely bankrolled Mancini’s match-day squad at an estimated cost of almost £250million. Sheik Mansour bin Zayed bin Sultan Al Nahyan, from the Abu Dhabi royal family, has travelled from his Emirates palace just once to watch the club in which he has invested such preposterous sums of money, nearing £1billion all told, in the 13 months since he took ownership. Not that Chelsea’s own billionaire proprietor, Roman Abramovich, had troubled to attend a match billed as a contest between the two most expensively assembled teams in the history of the English game. Abramovich is only an occasional visitor to Chelsea games these days, leaving others to keep him abreast of the team he built for an investment approaching £750m. Chelsea Manager Carlo Ancelotti had at his disposal yesterday players who cost the club £190m, but the Italian had personally sanctioned the purchase of only one: Ramires, a Brazilian who was signed this summer for £17m. Yesterday, Ramires looked like a boy lost in a man’s world and was caught in possession by James Milner, who threaded the ball to Tevez to score. Abramovich’s fortune has been reduced to around £7bn as a result of the global recession; and subsequently he has shown much less of an appetite for exposing himself to more expenditure in the inflated transfer market. Ancelotti is being encouraged to develop young players already at the club, and a 10-minutes cameo performance from 17-year-old substitute, Josh McEachran, illustrated how he will adapt confidently into the mainstream of English football. 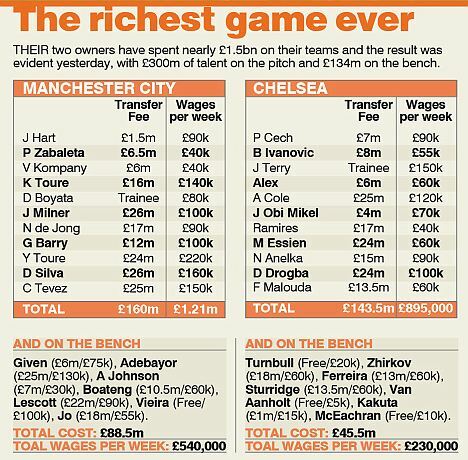 In comparison to Sheikh Mansour, Abramovich can claim to be impoverished. After buying City for £210m, he is said to have £550bn to buy foreign assets. His own wealth is counted in ‘many, many billions of dollars’. The rulers of Abu Dhabi have ownership of nine per cent of the world’s oil reserves, according to industrialists. Examples of his extraordinary wealth have numbered shirts in Manchester: No 7, James Milner was extracted from Aston Villa for £26m; No 21, David Silva signed for £26m from Valencia, while No 42, Yaya Toure, was brought from Barcelona for £24m. Left on the bench by Mancini yesterday were Emmanuel Adebayor (£25m), Joleon Lescott (£22m) and Jerome Boateng (£10.5m). After 18 seasons, the Premier League is now unrecognisable to the competition that was first won by Manchester United. In that first year, 1992-93, Chelsea were managed by Ian Porterfield, a former player; and the only true ‘non-British’ players on the club payroll were Russian goalkeeper Dmitri Kharine and defender Erland Johnsen. Manchester City’s team of the same season was driven by two hard men of the English game, Peter Reid and Steve McMahon. The club had three foreigners: Kare Ingebrigtsen from Norway, Dutchman Michael Vonk and Fitzroy Simpson, of Jamaica. Nowadays, the story for most young English footballers is that they have to have an exceptional talent, or be exceptionally lucky, to breakthrough into the Premier League. This trend disturbs Graham Taylor, a former manager of the England national team, with a lifetime in club management with Watford, twice, Aston Villa and Wolves. Taylor, at the City of Manchester Stadium as an analyst for BBC Radio, explained: ‘We were told that there would never be a Premier League Two; but what we are seeing, with relegated clubs being given four years’ parachute money, is a Premier League Two playing in the Championship. ‘All wealthy club owners, specifically the foreign ones, don’t understand that a football club was once the heart and soul of our communities. These men only come to England to become more wealthy. ‘It’s a crazy world now, isn’t it? I am not envious of what managers or players are earning; that just reflects the times we live in. But the heart and soul has been stripped from the game – and the game belongs to the supporters. Without them, there would be no game. Taylor, 66, clearly wonders about the conviction of men like Sheik Mansour and Roman Abramovich, who have ploughed hundreds of millions into two football clubs but cannot be bothered to show up to watch them play on a beautiful autumn day in Manchester.